(NaturalNews) An American nurse who was placed under mandatory quarantine in her home state of Maine after traveling to West Africa to treat Ebola patients says she plans to break her quarantine on Thursday, believing it to be unconstitutional. The 33-year-old Kaci Hickox stated on Good Morning America that she will even take the matter to court, should state officials refuse to let her leave her house and live her life, despite failing to wait out the proper incubation period. Hickox had been working with the France-based nonprofit Doctors Without Borders in Sierra Leone for five weeks and recently flew back to the U.S. via Newark Liberty International Airport in New Jersey. Upon landing, Hickox was immediately quarantined in a tent at University Hospital due to having a temperature of 101 degrees Fahrenheit, at which point she bemoaned the fact that she had to stay away from the general public in order to rule out a possible Ebola infection. Hickox was then given a blood test, which came back negative for Ebola. But since the incubation period for Ebola can last up to 42 days, or even longer in some cases, this test is hardly an accurate indicator of her health status. Even so, Hickox believes that she should be able to freely mingle in society, potentially infecting countless others with a disease that may cause their insides to literally melt out of their bodies. Part of Hickox's complaint alleges that the care which she received while under quarantine at University Hospital was subpar. Her tent, confirmed Doctors Without Borders to The Wall Street Journal, was not even heated. And her caretakers were wearing the exact same protective suits that she had worn in Sierra Leone while treating patients. The hospital denies these claims, insisting that while inconvenient, the quarantine was made as comfortable as possible for Hickox. Even so, the woman was eventually transferred to her home state of Maine where she was also told by the state to remain under mandatory quarantine, but this time in her home. Outraged by this restriction, Hickox has since stated that she will not abide by the order. "I don't plan on sticking to the guidelines," stated Hickox to TODAY's Matt Lauer about her current quarantined status in Maine. "I remain appalled by these home quarantine policies that have been forced upon me, even though I am in perfectly good health and feeling strong and have been this entire time completely symptom free." 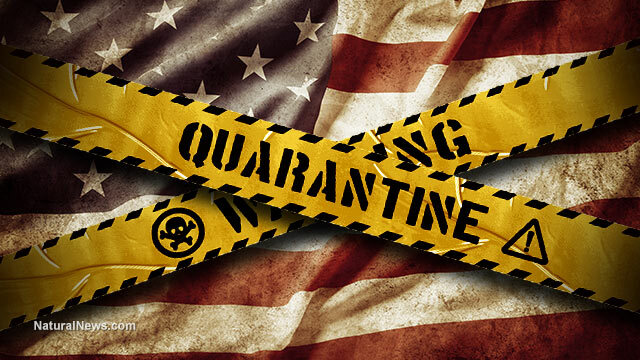 Is a forced quarantine unconstitutional? As the Ebola narrative continues to evolve, questions like those which Hickox is asking are becoming increasingly prevalent. Is it acceptable for government officials to impose mandatory quarantines in the interest of public health, or are such actions a violation of civil liberties? In Hickox's view, her own personal freedom outweighs the possible threat to public health, and also violates the U.S. Constitution. "I truly believe this policy is not scientifically nor constitutionally just, and so I'm not going to sit around and be bullied around by politicians and be forced to stay in my home when I am not a risk to the American public," she added. According to CNN, Hickox was asked by the state of Maine to remain in her home for at least 21 days since her last contact with an Ebola patient. In response, Maine officials say they are "exploring all of [their] options" for how to protect the public from a possible Ebola outbreak.